Alex Hutchinson's short film examines the current state of Bogota's bus rapid transit system. Graphic by Alex Hutchinson. The Colombian capital of Bogota has been praised for more than a decade concerning its dramatic transformation, which centered around the TransMilenio bus rapid transit (BRT) system, ushered in by former mayor Enrique Peñalosa. TransMilenio has been widely praised and imitated around the world and is considered the gold standard for BRT service. However, many consider the successful bus system to be struggling under its own success. What’s happened to the world’s most famous BRT? The myriad factors are complex, ranging from controversial public policy decisions, engineering mishaps, political contempt, marketing budget cuts and even earthquakes. This is story about TransMilenio in 2011: the good, the bus and the ugly. The mayor of Bogota presides over nearly 20 percent of the Colombian population and consequently is one of the most powerful figures in Colombia. Colombian law limits mayors to three-year consecutive terms. As a result, politicians avoid fomenting their predecessors’ initiatives, knowing their rivals are waiting in the wings. Coincidentally, in Bogota, no project is more attached to a politician than TransMilenio is to former mayor Peñalosa. After Peñalosa’s ambitious term as mayor of Bogota from 1998 to 2000, he has been followed by three administrations unsympathetic towards TransMilenio. A screenshot from Alex Hutchinson's latest video shows rush hour congestion on Medellin's metro system. Image by Alex Hutchinson. Since the 1950s, Bogota has been enamored with the thought of a metro, and this obsession has only grown since the mid ’90s, when Medellin, the country’s second biggest city (and Bogota’s bitter rival) began operating its above-ground metro service. Colombian federal finance funds 40 percent of all transit projects, while local government foots the rest of the bill. Bogota was close to getting federal funding for its long-awaited metro when those funds were diverted to earthquake relief and bank bailouts in 1999. While Peñalosa was willing to take federal funds to construct a metro system, his main intention as mayor was to create a sophisticated bus system. When the metro money dried up, so did his intentions of building it with city funds. 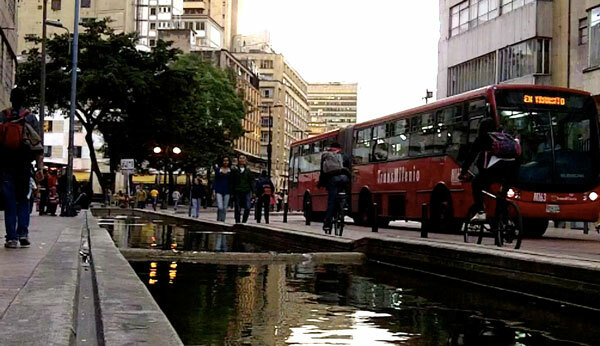 Bogota proves that BRT remains a cost-effective solution to mass transit challenges. Medellin’s metro serves 500,000 riders daily, while Bogota’s TransMilenio serves 1.7 million riders per day. Transportation experts recommend considering transit alternatives to provide the best use of limited resources. The estimated infrastructure investment for the metro was estimated at more than double the cost of the BRT system: US$4 billion versus US$1.97 billion. Moreover, the metro system would cover only 8 percent of the city, while the BRT system would cover 85 percent. According to a recent study performed by the Institute for Transportation & Development Policy, TransMilenio was awarded the gold standard in BRT service, receiving a score of 93 out of 100. If gold standard BRT becomes adopted in U.S. cities, such as the ambitious plans of Chicago, New York and in the Washington, D.C. suburbs, perhaps Bogota’s transportation envy will subside. Until then, TransMilenio’s accolades will most likely fall upon deaf ears. “I strongly believe Bogotanos want better transport, and metro is the image of that; it embodies the promise, no matter the cost or the coverage,” Hidalgo said. “The fact that the TransMilenio has problems reinforces that idea.” Major problems include station crowding, poor road quality, bus frequency and passenger congestion in buses. Cyclists share the road with TransMilenio along Avenida Jimenez. Image by Alex Hutchinson. Road quality along Avenida Caracas, the first phase of TransMilenio, has some of the worst road quality of the bus system. Foundations under concrete slabs were incorrectly designed and constructed. As a result, cracks and potholes proliferate along the route. El Instituto de Desarrollo Urbano (IDU), or the Urban Development Institute, is in charge of maintaining road infrastructure for the entire city, including the TransMilenio system, and has not been aggressive enough in road upkeep. Lack of maintenance has tainted the image of the system. At peak hours, stations are uncomfortably crowded for passengers. People crowd around both the entrances and exits of the buses, making it nearly impossible for users to depart the bus at rush hour. Passengers at stations refuse to give right-of-way to exiting bus riders, creating stressful bottlenecks. It’s common to miss one’s stop because of the difficulty in exiting the bus. TransMilenio can currently serve up to approximately 45,000 passengers per direction per hour—a figure competitive with metro lines in Mexico City and London. Most of the TransMilenio bus fleet is articulated buses, which have a capacity of 160 passengers, in addition to new bi-articulated buses, which offer maximum occupancy of 260. However, Hidalgo suggests occupancy should be less than 130 passengers per bus during peak hours to provide higher quality service. “With 160 passengers per bus, you end up inviting a lot of users to motorcycles and cars,” he said. Bogota is expected to add approximately 300,000 new cars to its streets by the end of this year—an increase of 18.2 percent from last year. Transmilenio is a public-private partnership that receives no subsidies from the government. The 1,700 Colombian peso fare (roughly US$1) is exorbitantly expensive for low-income users whose daily salary averages US$3. During the implementation of the system, Mayor Peñalosa was adamant about not subsidizing TransMilenio, preferring to use those funds for other essential city functions, such as education, security, health and public space. Consequently, policy experts increasingly suggest a congestion tax at peak hours—akin to what’s being done in London or Singapore—to finance the subsidy. The city currently restricts drivers with a policy known as Pico y Placa, which restricts car use depending on license plate numbers on designated days of the week. Drivers have found a way around this policy by simply buying a second car and leaving it in the garage on restriction days. Instead of this money going to car dealerships, the money could be a tax that could be reinvested back in public transportation. TransMilenio operators run a formal transportation system with electronic fare collection, state-of-the-art buses and tax payment, in addition to employing drivers for 6 to 8 hours per day with benefits. This is in contrast to Bogota’s collective bus system, whose drivers purchase routes from bus operators. These drivers are paid per customer and operate without formal stops. The city is currently developing the Sistema Integrada de Transporte Publico (SITP), or the Integrated Public Transportation System, an ambitious plan to integrate the collective bus system to TransMilenio. However, it comes with great risks, as the service under the TransMilenio agency’s jurisdiction will jump from 1.7 million users per day to nearly four times that size. TransMilenio’s planning and operational capacities are being spread too thin, focusing on the restructuring of the collective bus system, in addition to dealing with the struggling service. While the TransMilenio agency has been upgrading service, Hidalgo senses the agency has not been aggressive enough. Station expansions have expanded capacity, and increasing farecard sales outside of stations has reduced pedestrian friction and congestion. But more aggressive measures are needed. The implementation of new trunk routes along Avenida Septima or Avenida Boyaca are needed to reduce demand along Avenida Caracas. Demand along this route is over capacity because of the stagnation of new routes, which would have connected the portal stations, thus reducing demand along the busiest parts of the system. Part of the problem is bureaucratic: new infrastructure depends on the Urban Development Institute, whereas new routes and traffic measures depends on the Secretary for Mobility. Therefore, the TransMilenio agency’s role is limited. 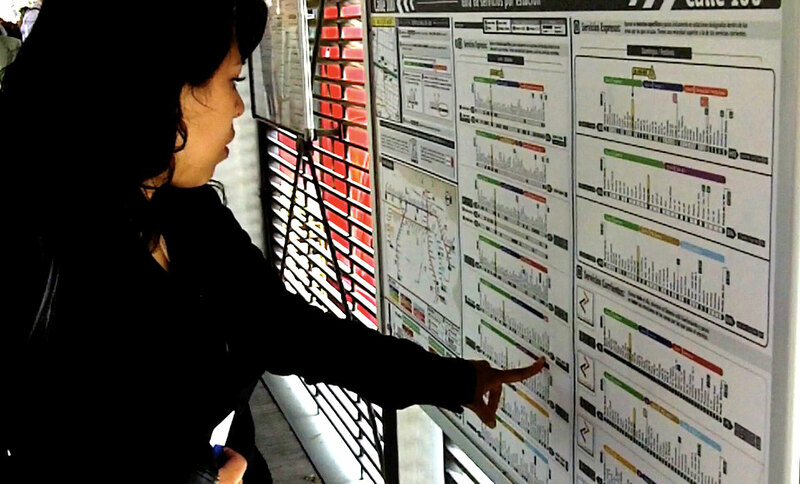 A TransMilenio passenger deciphers the system map. Image by Alex Hutchinson. While many of the problems of TransMilenio are endemic problems requiring long-term engineering or policy solutions, issues involving customer morale and education could be implemented in a relatively short amount of time. More maps and wayfinding tools are needed in both stations and buses. There are no maps located outside of TransMilenio turnstiles. 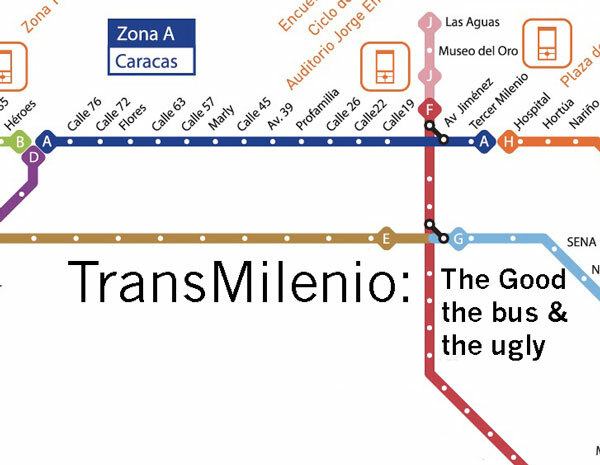 Inside stations, there are typically two types of maps: a complex map detailing all stations and routes offered by the TransMilenio, and a more simplified map showing all routes leaving from the particular station where the passenger is located. These maps are effective and easy-to-use with practice, however, on average, there are only three to four sets of maps per station, and stations are typically three city blocks long, creating a scarcity of knowledge available to the rider. Inexplicably, bus interiors offer no maps whatsoever. The bus features digital displays alerting passengers of the two approaching stations, yet on a bus packed with 160 people, it can be difficult to see or hear the information. The triumphs of TransMilenio are well-documented. After a decade, Transmilenio has made great achievements to promote an affordable mass transit system that is a particularly successful and applicable model in developing cities where municipalities have finite resources and face numerous challenges. The success of TransMilenio explains why the model has been adopted in more than 100 cities on every continent. TransMilenio’s success is essential because it has served as a model for so many of the world’s BRT systems. Air quality has improved in Bogota, especially along TransMilenio routes. Road safety has significantly improved, too. Fatalities have decreased 60 percent from 1,299 in 1996 to 551 in 2007, according to the Ministry of Transportation of Colombia. Accessibility for the elderly, disabled, and mothers with small children has also improved, compared to the collective buses, which are not handicap-accessible. Furthermore, 1.7 million people per day use the TransMilenio and travel times have reduced by 32 percent. With the expansion of the system, this progress will only continue. Filmmaker Woody Allen said, “A relationship, I think, is like a shark, you know? It has to constantly move forward or it dies.” The same could be said about the current state of the Bogota’s BRT: it needs to keep progressing to keep up with the demand of this growing city of more than 8 million people. The intention of this post was not to praise nor bury the TransMilenio. More needs to be done to address the issues confronting the decade-old system. The problems are complex and multifaceted, but a pragmatic and factual discussion must enter the public discourse in order to ensure the system’s success.